"On every major issue I shall act as instructed by my constituents"
In this century we shall face vital challenges: fair society and justice; total war or global peace; natural resources; human genetic engineering and life extension; intelligent robots; and the settlement of space. These vital issues can decide our long-term survival and shape our destiny. With the wrong decisions we may face extinction, but with the right decisions, humanity and life can have an immense future. Such profound decisions cannot be trusted to individuals with limited vision. Rather, these powers must be vested in the communal wisdom. This shared wisdom reflects our deepest instincts of life and survival. Direct Democracy brings out this common wisdom, based on the decency, good will and common sense of most people. Can the Public Judge Wisely? All democracy is based on public judgment. Representative democracy trusts that we can judge political candidates. If so, we can judge issues on merit even better. Direct Democracy has been tested with success. Some local communities and nations already use binding referendums. In Switzerland, this secured peace and prosperity for centuries. With information technology, direct democracy can now govern locally, nationwide and globally. Representative democracy was needed when remote constituents could not be consulted. With the internet the public can now decide directly on all major issues. The representative system is outdated, and it is ready to be replaced by true democracy. Representative democracy is always preferred to tyranny, but it has major faults. (1) Arbitrary linkage of issues. Most voters agree with politicians on some issues and disagree on others. When a voter supports a party on some issues it must also support their party's objectionable policies. Under Direct Democracy the public decides each issue independently on its own merits. (2) Political Wheeling and Dealing. Politicians and parties form coalitions and make deals which may compromise the very principles for which voters elected them. (3) Corruption and Special Interests. Elected officials can be swayed by corruption or by various forms of bribery, including campaign contributions. In Direct Democracy special interest cannot bribe the public vote. (4) Personalities. Many voters are influenced by the charisma and personalities of politicians, sidetracking their stands on issues. This allows charismatic officials to pursue policies against the majority will. In Direct Democracy the public votes on issues, not personalities. How Will Direct Democracy Work? The power to formulate laws and policies shall be vested directly in the people. The Constitution describes the priniciples, procedures and institutions that implement this principle. The people will define the major issues and policy alternatives by proposals that set the agenda for binding referendums and polls. Public decisions will be based on well-informed choice. Public debates must be factual, balanced and impersonal, with each issue deliberated and decided on its own merits. Policy options will be selected from public proposals and the voters will rate the options in referendums or polls. The highest rated alternative will become the law. The public law will be implemented by public Policy Juries, Expert Agencies and Expert Courts. High officials and judges will be elected directly based on experience and integrity. All actions of the Expert Agencies and Courts can be appealed through referendums and polls. The public will is the ultimate authority, and public decisions shall constitute the body of the law. Expert courts will interpret the public law through dispute resolution and court rulings. The rulings can be appealed to the Supreme Court, and ultimately to the public through referendum and polls, which serve as the ultimate law. The elected heads of the Expert Agencies will make up the Executive Council that will handle national emergencies. The Executive Ombudsman will handle acute emergencies and return power to the Executive Council as soon as possible. Public Officials and Justices of the Supreme Court will be eleced by public vote strictly on merit, eliminating the effects of personalities. For ceremonial roles, Representatives of State will be selected by chance from the general public. True democracy should reflect the public will and no individual or institution should have excessive power. The Expert Agencies will be guided by public Policy Juries. The Expert Agencies will be guided by public Policy Juries. Disputs between these two groups will be settled by Public Ombudsmen or Expert Courts. Final appeal will be to public decisions through referendums and polls. Direct Democracy should be flexible but not fickle. The Constitution can be amended through repeated approval by a significant majority. The law should reflect the public will as it prevails at any time. "On every major issue I shall poll my constitutes and vote in Congress (or Parliament) strictly as instructed by the majority." When Direct Representatives become the majority, government policy will automatically confirm to th epublic will. How will the Direct Representatives Function? Selecting Direct Representative candidates. Every qualified citizen should have the chance to serve as a Direct Representative in the legislature. The Direct Representative may be chosen by lot from voters who ae capable and interested to serve. Defining the issues. Once elected, the Direct Representative will poll the constituents to determine their preferred referendum and poll issues. The Direct Representative will assemble a broad Voters Panel for ongoing advice on major issues. Electorate-wide polls and referendums. The Voters Panels will help to prepare policy options and balanced debate materials for electorate-wide polls and referendums. The public can also initiate polls and referendums. Direct Representatives in Congress/Parliament. The Direct Representatives will act in Congress or Parliament as instructed by the district-wide polls and referendums and by the Voters Panels. As their nuber in the legislature grows Direct Representative groups can institute trial Proposal Banks, Policy Juries, Expert Agencies and Expert Justices. If the public approves, then these can evolve into institutions of a full Direct Democracy. The following campaign materials were used in the first Democracy campaign during the 1984 congressional elections in the Maryland, USA District 6. "On every major issue, I shall poll my constituents and vote in Congress strictly as instructed by the majority." Major Issues: I shall conduct fair and statistically reliable district-wide polls and hold the result binding for my vote in Congress. Minor Issues: For each Congressional sessions, I shall poll my constituency for guidelines, then with my best judgment, vote in Congress accordingly. On minor issues, if 1,000 or more constituents so request, I shall conduct a poll and vote in Congress accordingly. New Legislation: I will exercise leadership by proposing new legislation. However, I shall submit new legislation to Congress only if approved by a District-wide poll. Also, if 1,000 or more constituents request new legislation, I shall draft such legislation, submit it to a District-wide poll, and if approved, to Congress. Only a candidate pledged to direct democracy can guarantee that District 6's vote in Congress will reflect not lobbyist, PACs, campaign donors, not even the representative's personal views - but, in the true spirit of democracy, the majority of the District's Voters. How Does Direct Democracy Work? Every representative, senator or president dedicated to Direct Democracy votes in Congress or acts as chief executive strictly as directed by the majority of his/her constituents. The majority view is decided by referendums or statistically honest polls. Direct Democracy representatives will poll the constituents as to which issues should be subject to referendums; what are the voter’s guidelines on minor issues; what new legislation do the constituents wish to pass. The instructions obtained from the constituents will be binding. Direct Democracy candidates will not accept campaign contributions from any organizations or PACs. It is the spirit of democracy that the solid good common sense of the people is the best judge of the public's own interest. In contrast, elected officials are corruptible, especially as the power of campaign contributors, PACs and lobbies in Washington grow. (2) In Direct Democracy every issue is decided independently. In contrast, representative democracy forces unreasonable linkages. In voting for a representative on one issue, the citizen also empowers the representative on other issues and policies which the voter often opposes. Also, representatives chosen for personal charisma are often incompetent or objectionable on many issues. In Direct Democracy every issue is judged separately on its own merits; and issues count, not personalities. The founding fathers had to institute the representative system because communications from remote constituents were inefficient. Today, communications are instant, reliable polling methods exist, and computers help to organize the data. How Do We Achieve Direct Democracy? We can achieve Direct Democracy without changing the present system in any way, by electing candidates pledged to the Direct Democracy process. As the number of Direct Democracy representatives and senators grows so will the true representation of the public in Congress. Ultimately a system of governance by direct popular referenda and polls may develop through constitutional amendments. 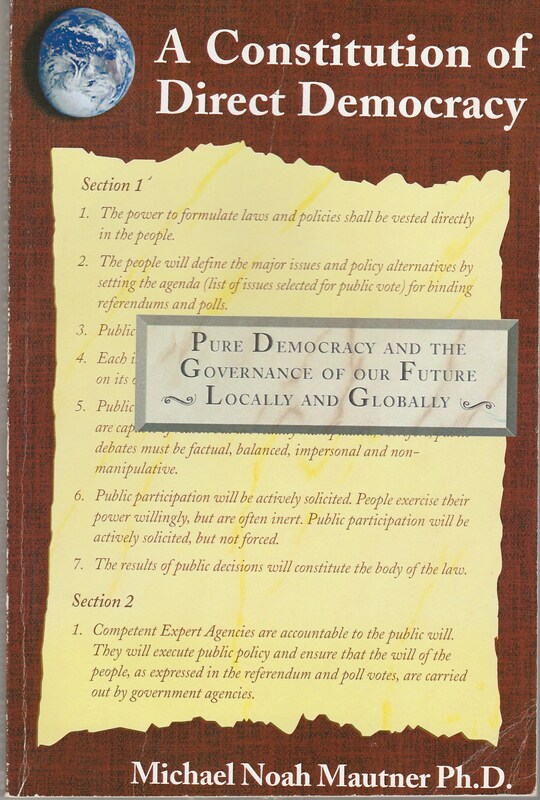 Such complete Direct Democracy may be practiced from town to global scale. The American Constitution does not provide for political parties. The Direct Democracy Campaign is an assembly of individuals who wish to exercise true self-government. The Campaign will encourage candidates as individuals pledged to the Direct Democracy procedures. We shall help each other by advice, a network of volunteers for candidates, and possibly by small individual campaign contributions. Join the Direct Democracy Campaign. Volunteer for a Direct Democracy congressional campaign in your area. If there is none, run for office as a candidate pledged to operate follow Direct Democracy principles and procedures.